"If you want peace, prepare for war. "- Publius Flavius Vegetius Renatus. It had been long ago that Damocles has followed Cal Maximus within his Legion, even before it was a legion at all. Those were simpler times... when they could run into a town and decimate it themselves. Simply the two of them armed with crude weapons, taking down dozens of degenerates. Simple and good times. Those were the mercenary days, when they didn't have to consider war crimes and such. Eventually Cal proclaimed himself Emperor once he obtained enough followers, Damocles obviously becoming a right hand man but more of a decorated hero. Were it not for Damocles, Maximus may have died. But that is a tale nearly everyone within the Legion of Maximus knows. Damocles's reputation has become a mix of both legend and truth, some actions were questionable and other quite heroic. His brute force and incredible endurance is as though he has gotten a blessing from Mars himself. In general, it can be stated that Damocles is above any normal human in physical tasks. From time to time, Damocles has revealed to have a degree of intelligence but his rash decisions and general pompousness make him throw caution to the wind. Damocles leads a small special force within the Legion of Maximus, the Mors Cohortis. They generally operate in close quarters combat, tracking of individuals, and the protection of the Emperor. Their training consists of a thirty week program, trying to weed out the weak and produce only the strong. Any physical drawbacks will make a recruit unsuitable. The future Mors Cohortis are taught how to use nearly every weapon and their own body to the fullest extent. From over two hundred initial individuals, twenty four are selected. This creates three contubernium of elite infantry, ready to die for Cal Maximus, and Damocles if need be. Damocles likely "suffers" from gigantism, as he stands at large stature of 2.48 meters (eight feet two inches). His bone density is strangely denser than usual, allowing him to take more damage easily. However this makes him sink in water and other things more easily. As far as weight and muscle mass, at four hundred pounds this hulking mass of a man can easily plow through a battle line. It cannot be emphasized more how resilient this "normal" human can be, he took several bullets to the chest at nearly point blank without damage. He can easily tear a man's spine from body with his fists, generally doing so to his servants that are no longer of use. No one but Cal Maximus has seen the face of this monster of a man, leading many to speculate what's under the steel helm of his. 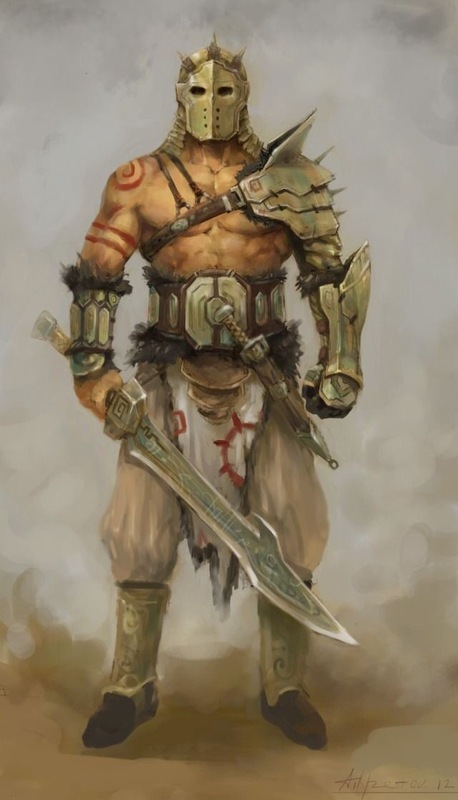 Damocles prefers the use of melee weapons, fists and thrown weapons, but will use other weapons that Cal has taught him to use, firearms and other ranged weapons. When not in battle, Damocles is often watching gladiatorial fights, chariot races and whatever festivity occurs at the time. Damocles wasn't always the way he currently was, he used to have another name... one forgotten to time. Damocles, heir to the throne. Alternatively known as "Biggus Dickus"
Lmao, Biggus Dickus. Monty Python is funny asf man. Idk about the heir to the throne part.